The RoughRiders' "Dude Perfect Night," attended by the trick-shot collective, nailed the 2018 Promo of the Year MiLBY Award. Prior to this season, the biggest crowd in Frisco RoughRiders history was for June 12, 2015's "Full House Night" featuring Dave Coulier. That night, 11,927 fans packed the house, a mark that stood until 12,067 fans showed up at Dr Pepper Ballpark for July 20's "Dude Perfect Night." This evening-long celebration of the Frisco-based trick-shot collective wound up setting more than attendance records. After two weeks of fan voting, it emerged triumphant over nine other nominees en route to winning the 2018 Promo of the Year MiLBY Award. Dude Perfect, who have nearly 36 million YouTube subscribers as well as their own show on the Nickelodeon network, are comprised of Tyler Toney, Cody Jones, Garrett Hilbert and twins Coby and Cory Cotton. The quintet (as well as their mascot, Panda) are no strangers to the RoughRiders' home of Dr Pepper Ballpark. Three Dude Perfect videos -- Baseball Trick Shots, Baseball Edition and Dallas Stars Edition -- have been filmed there, resulting in over 40 million YouTube views. 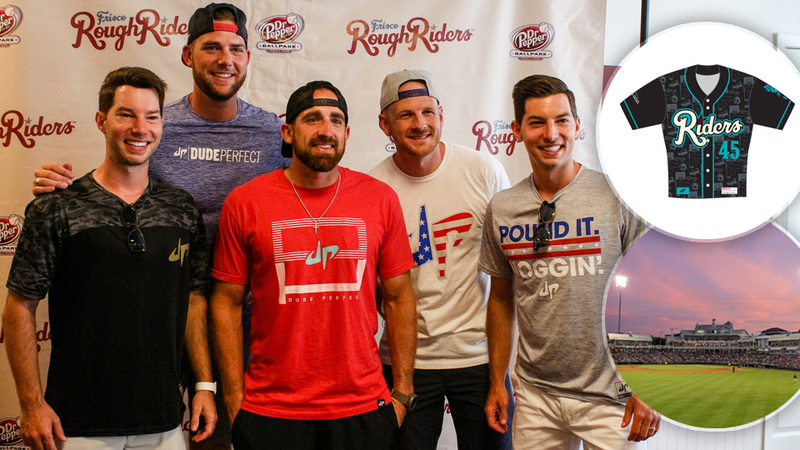 Dude Perfect's local ties and familiarity with the facility made them a natural fit for a RoughRiders' promotion. "As they shot more and more videos at the ballpark, the idea of a [Dude Perfect] promo came about. We wanted to do something that could fit into their travel and shooting schedule," said RoughRiders president Andy Milovich. "We had cultivated a relationship and wanted to make this work for both them and the fans. ... This resonated from a charitable standpoint as well, thanks to a partnership with the Make-A -Wish Foundation." The Double-A affiliate of the Texas Rangers wore Dude Perfect theme jerseys that Friday evening with the proceeds of a postgame auction raising over $5,000 for the Make-A-Wish Foundation. The dudes mingled with the first 1,000 fans in attendance during a pregame meet-and-greet session, threw a ceremonial first pitch, participated in between-inning contests and led the crowd in "Take Me Out to the Ballgame." The entire evening was filmed by a Nickelodeon crew for a yet-to-be-aired episode of the Dude Perfect TV show. "We had a blast teaming up with the RoughRiders for 'Dude Perfect Night' at the Ballpark," said Coby Cotton. "It was a great opportunity to connect with our fans in an especially fun way, and we were humbled by record-breaking attendance. Huge thanks to everyone involved!" "The thing that jumped out at me the most was the overall demand for tickets," added Milovich. "We sold out a week in advance. On the day of the game, there were three pairs of tickets on Stubhub, $7 lawn seats, that were going for $85 a piece. The excitement and enthusiasm was something I could have never imagined. I knew it would be big, but this was overwhelming." That enthusiasm carried over into the online MiLBY Award voting, with "Dude Perfect Night" receiving 28 percent of the overall vote amid a field of 10 nominees. The Myrtle Beach Pelicans' "Deaf Awareness Night" finished second with percent, while the Fresno Grizzlies' "Coming to Fresno" was the second runner-up with 18 percent. "Winning the MiLBY is great. It's one of those things that is very exciting in this industry, whether it's a MiLBY or a Golden Bobblehead, seeing the pride and the excitement that it generates in the staff," said Milovich. "As we go into the planning season, nailing down what our promo schedule looks like, we ask ourselves, 'Is this something that will win one of those awards? Will it meet the expectations of what it takes to do that?' It forces us to think bigger, and that makes us better as a team and better as an industry."